The draw for the 26th European Championships in trampoline, tumbling and double mini-trampoline was held on the National Gymnastics Arena in Baku. 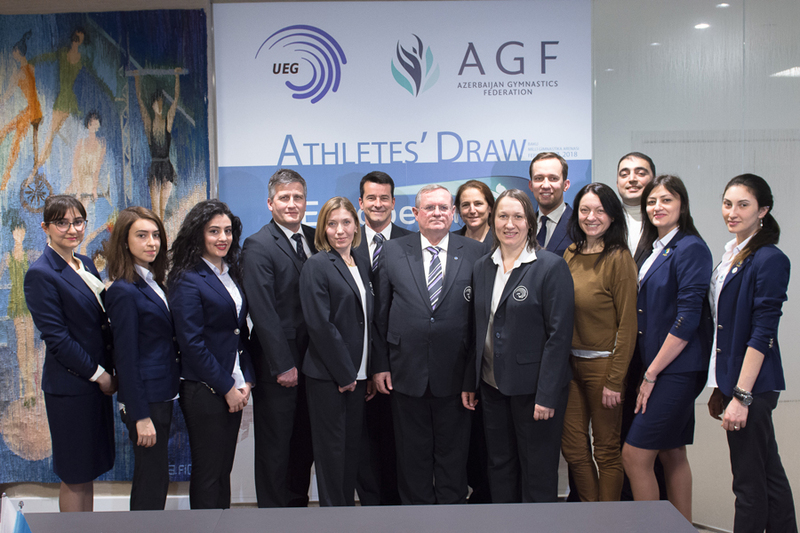 The ceremony for the Championships was attended by Farid Gayibov, the President of the European Union of Gymnastics (UEG), Vladimir Zeman, President of the UEG Technical Committee in Trampoline Gymnastics and its six members – Babette van Wetering, Irina Karavaeva, Luis Nunes, Patrick Siegfried, Mariela Stoycheva and Konrad Bojakowski – as well as the representatives of Azerbaijan’s Gymnastics Federation (AGF) and the members of the Local Organising Committee. The draw was carried out for the junior and senior categories for both among men and women in the individual trampoline and synchronised trampoline, tumbling and double mini-trampoline, as well as the team events. The European Championships, which is being held on April 12-15 in the Azerbaijan capital for the first time, will bring together more than 700 gymnasts from 25 countries in the seniors and 26 in the juniors. The Championships are also qualifying events for the 2018 Youth Olympic Games in Buenos Aires, Argentina, and the 2019 European Games in Minsk, Belarus. The draw results can be found here: seniors and juniors.